Neurons can be divided into three functional classes: afferent neurons, efferent neurons, and interneurons. Afferent neurons convey information from the tissues and organs of the body into the central nervous system, efferent neurons transmit electric signals from the central nervous system out to effector cells (particularly muscle or gland cells or other neurons), and interneurons connect neurons within the central nervous system (Figure 8-4). As a rough estimate, for each afferent neuron entering the central nervous system, there are 10 efferent neurons and 200,000 interneurons. Thus, by far most of the neurons in the central nervous system are interneurons. At their peripheral ends (the ends farthest from the central nervous system), afferent neurons have sensory receptors, which respond to various physical or chemical changes in their environment by causing electric signals to be generated in the neuron. The receptor region may be a specialized portion of the plasma membrane or a separate cell closely associated with the neuron ending. (Recall from Chapter 7 that the term "receptor" has two distinct meanings, the one defined here and the other referring to the specific proteins with which a chemical messenger combines to exert its effects on a target cell; both types of receptors will be referred to frequently in this chapter.) Afferent neurons propagate electric signals from their receptors into the brain or spinal cord. Afferent neurons are atypical in that they have only a single process, usually considered to be an axon. Shortly after leaving the cell body, the axon divides. One branch, the peripheral process, ends at the receptors; the other branch, the central process, enters the central nervous system to form junctions with other neurons. 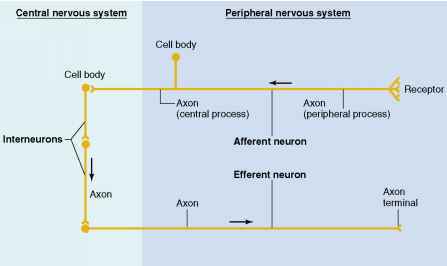 Note in Figure 8-4 that for afferent neurons both the cell body and the long peripheral process of the axon are outside the central nervous system, and only a part of the central process enters the brain or spinal cord. The cell bodies and dendrites of efferent neurons are within the central nervous system, but the axons extend out into the periphery. The axons of both the afferent and efferent neurons, except for the small part in the brain or spinal cord, form the nerves of the peripheral nervous system. Note that a nerve fiber is a single axon, and a nerve is a bundle of axons bound together by connective tissue. Three classes of neurons. The dendrites are not shown. 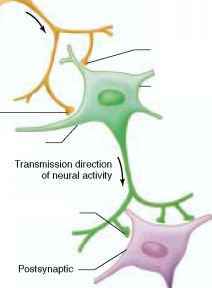 The arrows indicate the direction of transmission of neural activity. The stylized neurons in this figure show the conventions that we will use throughout this book for the different parts of neurons. As discussed later, there are efferent components of the peripheral nervous system that consist of two neurons, not one as shown here. D. Account for 99 percent of all neurons efferent neurons varies according to the complexity of the action. The knee-jerk reflex elicited by tapping below the kneecap has no interneurons—the afferent neurons end directly on the efferent neurons. In contrast, stimuli invoking memory or language may involve millions of interneurons. Interneurons can serve as signal changers or gatekeepers, changing, for example, an excitatory input into an inhibitory output or into no output at all. The mechanisms used by interneurons to achieve these functions will be discussed at length throughout this chapter. Characteristics of the three functional classes of neurons are summarized in Table 8-1.
axon terminal and a second axon terminal to modulate its output. A neuron conducting signals toward a synapse is called a presynaptic neuron, whereas a neuron conducting signals away from a synapse is a postsynaptic neuron. Figure 8-5 shows how, in a multineuronal pathway, a single neuron can be postsynaptic to one cell and presynaptic to another. A postsynaptic neuron may have thousands of synaptic junctions on the surface of its dendrites and cell body, so that signals from many presynaptic neurons can affect it. What neuron has a receptor at the peripheral ending? 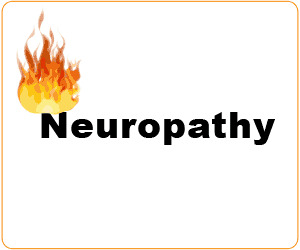 What class of neuron lie within the CNS? What receptor are seperate cell that synapse with terminal ending of afferent neuron? 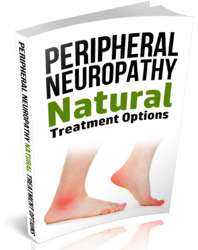 What are the three functional categories of the nervous system? What is the function of efferent presynaptic neuron? What are at least three functions of afferent and efferent neurons/ nerves serve? What neuron connects an afferent neuron to an efferent neuron? What neurons have a short single process leaving the cell body? What functional type of efferent neuron conducting action potentails to target organs? Can a membrane have both afferent and efferent? What are the three functional groups of neurons? Do afferent neurons transmit information to effector organs? Which functional class of neurons lies entirely within the central nervous system? Are neurons divided into three functional classes? What is the functional group of a neuron?